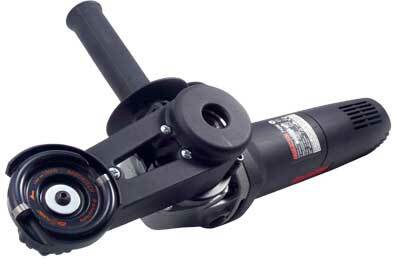 I have tried just about every type of angle grinder based rotary cutter on the market and have come to the conclusion that none of them holds a candle to those produced by Arbortech. I tried using the Mini Turbo fitted directly to the angle grinder with the extension shaft supplied but found it nothing like as good as its big brother. 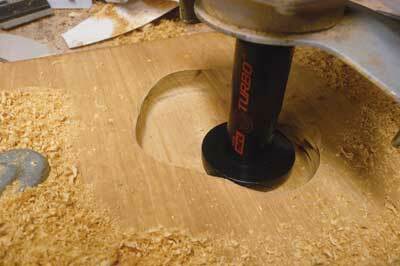 There were no apparent advantages when working on a flat surface but it really comes into its own when it is required to cut deep into the surface,as one would with a router. You can use all types of template if required to produce deep, shaped depressions as it doesn't cut on the side. If you wish to remove large amounts of waste material from the centre of bowl blanks then this setup is ideal, allowing you to go down about 100mm quickly and safely with the ability to produce vertical sides if required. This takes a bit of getting used to as the disc can skid across the surface of the timber until you get the hang of knowing which way to move it to cut as you wish. I can see that there will be numerous applications where this tool is invaluable with a variety of guides and templates. Also in the kit are sanding discs that fit directly on the extension shaft with the cutter removed and these are a very effective addition. Using these in conjunction with each other will result in an excellent finish. 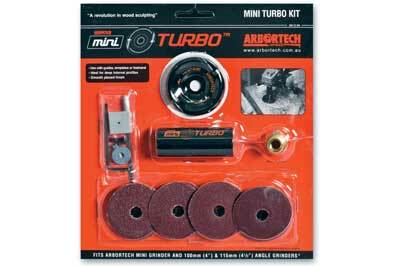 Once fitted to the mini Arbortech attachment on the angle grinder, it was a completely different tool. Although you can't cut deep into the wood, it will get into otherwise inaccessible spaces and gives an altogether superior finish to the mini cutters usually fitted. It is easy to use and removes wood at a rapid rate - how heavy handed you wish to be is only limited by the durability of the rubber drive belt. When really pushed the belt on my unit did eventually give up the ghost but, to be honest, I don't think anyone in his right mind would normally push it to that extent. As with all tools of this type it is most important to have the appropriate safety and protective equipment in use: goggles, dust mask, ear and head protection. Most people will happily wear goggles and mask, but this tool will project bits of wood into your ears with no problem so a woolly hat or ear protectors are a must. The individual cutters can be rotated if they lose their edges and I imagine that they could be sharpened on a flat stone if desired. Replacements can be purchased quite reasonably so this is not really an issue. Would you buy one of these? This really depends on how you feel about power cutters - some people love them and others hate them. If you have a job where you need to remove large quantities of wood in hard to reach places and have difficulty doing this with a gouge and mallet, then this is the tool for you. Anyone intending to purchase one of these tools needs to be aware that this is the little brother of the power plane and only cuts on the flat surface - you cannot plunge it in edgeways like the standard or mini Arbortechs. If you are careful about working with the grain you can get quite respectable shavings from it but, if used across the grain you will still have the same problems with chips and dust that get everywhere. It is certainly much better than anything else similar that I have tried and worth adding to your toolbox.